Do you remember the first food you ever harvested for yourself? Growing up in a suburban environment, my first memory of harvesting comes in young adulthood. I may have snacked on a wild blackberry before that, but the first time I really harvested was when Casey and I were attending university in Bellingham, Washington. When we were living in Bellingham, it felt like a city that had a former glory — mansions turned into multi-unit residences were all over town, symbolic of a time when there were people with a lot of money and willingness to invest it in domestic bliss. And, often in the yards of these old houses (large or small), there would be fruit trees leftover from this earlier era, when apparently part of the plan for domestic bliss included being able to pick some fruit in one’s own yard. By the time we lived there, many of these old apple and plum trees were gnarled with age and lack of attention. We would walk through neighborhoods and see fruit falling to the ground, unattended by the current inhabitants of the homes (in many cases, college students or younger renters). But, for whatever reason, the trees remained uncut and growing all over the city. There was one row of old plums trees in particular that Casey and I “discovered” early on. They grew behind one of the dorms at the far south edge of the campus, probably leftover from before the property was owned by the university. Those Italian plums always ripened in early September, before students had even returned to campus. 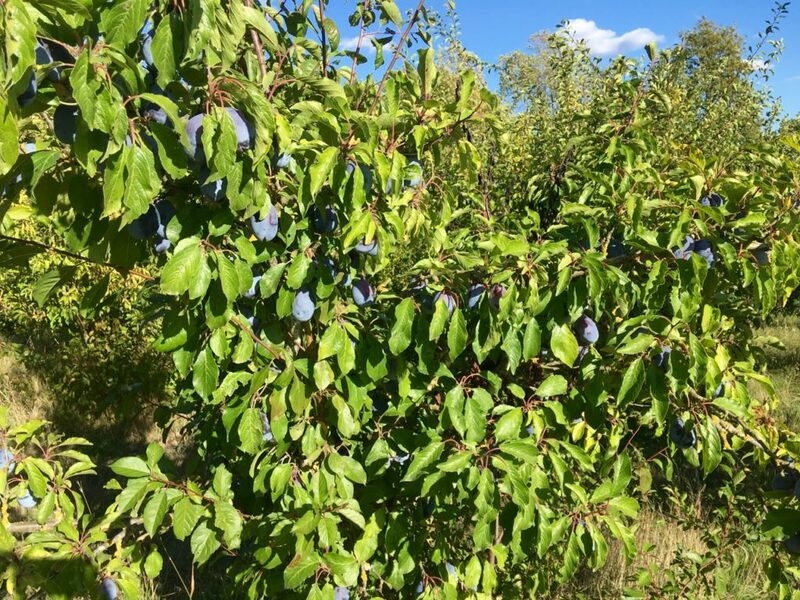 The first year Casey and I found them, we thought we’d hit the mother lode — several trees full of ripe plums, and no one around to eat them! We returned that year, and many summers after, with bags and picked enough plums to eat and put up (maybe we dried them in our oven????). Those first experiences with fruit trees in neighborhood yards were a revelation to me. Every year, the fruit felt like such a gift from the universe. Each fruit such a marvel of sweetness and nutrition! Just growing there, year after year, even in cases of minimal to no maintenance. Now that we have our own well established orchards, which we planted not quite a decade ago, the miracle remains as remarkable to me as ever. As the summer wanes and colorful orbs of different shapes and hues fill our trees, I cannot believe the annual gift of these trees. Vegetables are cool and delicious and we love growing them too, but they also represent a lot of work each year: sowing, planting, weeding, harvesting. In contrast, now that the orchards are established and growing in our good soil, they feel — not quite easy (that would miss the point of the work we do do) but abundant in their response to our simple efforts. It feels so collaborative. We give the trees a home, and each year they give us fruit. And, we are grateful. We’re definitely in the high season for fruit now too: perennial and annual both. Look at this week’s list of offerings! Oh my! What a delicious time of year this is. Enjoy this week’s vegetables! And, fruits! Concord grapes — You know that classic “grape” flavor? That distinctive flavor comes from Concord grapes. This particular planting is said to be from cuttings carried on the Oregon Trail! One important warning: because this is an old variety, the grapes have seeds. Some people like to just crunch them up and swallow them with the grapes. I usually spit mine out (but I also usually eat these grapes standing outside by the trellis, so it’s easy to spit them onto the ground). It’s up to you, just be warned so you’re not surprised by their presence! Delicata winter squash — This last week of rainy weather felt a lot like fall, didn’t it? Fall does officially arrive this coming Saturday, and with it so many wonderful fall foods too, including the first of everyone’s favorite Delicata winter squash. Two simple ways to prepare these: slice lengthwise, remove seeds, put on a pan cut-side down, and drizzle with olive oil. Roast at 375° until the cut edge is caramelizing and the flesh is cooked through. Or, slice the other way and make thin Delicata “rings.” Remove the seeds and roast these on a pan with lots of butter or oil until they are crispy and soft inside. Either way, you can eat the skin! This entry was posted in Weekly CSA Newsletters. Bookmark the permalink.